Nothing against James McAvoy (who was good in so many movies) or his director Jon S. Baid, but my patience drowned while trying to swallow this atrocity. 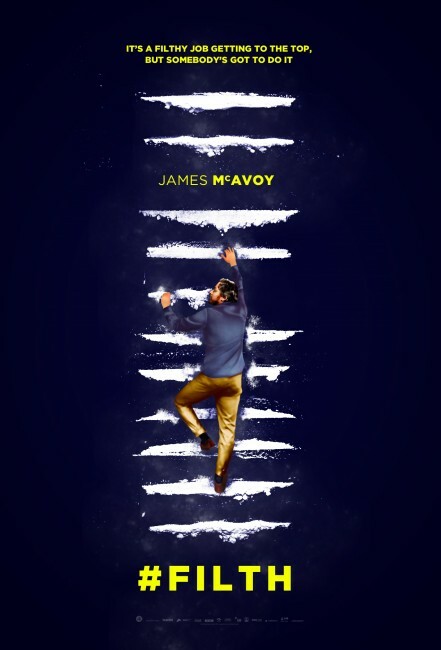 McAvoy plays a self-obsessed bipolar detective who hallucinates, blackmails, boozes and drugs his way around Edinburgh, trying to solve a murder case but actually getting lost in his own fantasies. And he does it for the whole damn film, which is exactly my problem: far too often, I was repelled and wanted to look away. It’s easy to admire McAvoy’s performance, but there isn’t much to like in his character. We learn all we need to know about him in the first 5 minutes, and things go downhill from there. The rest of the cast (including Jamie Bell, Jim Broadbent and Imogen Poots) tries to stay solid as the movie goes off the rails. But in the end, I couldn’t wait for it to end. I hope McAvoy turns his attention to projects that are worthy of his time and talent. “Filth” left me with nothing except regret that I’d invested the time to watch it. It’s a filthy movie.